Once again, I've gotten behind. Since publishing the Creative Spark Glossi I've done nothing but try to catch back up. I'm totally not there yet. For today, I'm just going to quickly share this week's menu (which should have been done yesterday) and then try to move on down my to-do list. As well, it's not a massive menu as we've got a busy week ahead. I hope you understand. 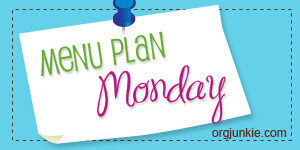 I'm linking this up at I'm an Organizing Junkie's Menu Plan Monday (even if it is Tuesday). Pasta with mushrooms: I love, love, love this recipe. The mix of the touch of Parmesan and cream and the truffle oil make it decadent without getting too rich. Yum! Thai chicken tacos: These were really tasty and pretty easy to make overall. I will possibly make them again. And that's it for now folks! I hope the winter and the holidays are treating you well, and I hope to pop back in soon (but the way things have been going I can't make any promises right now.) Enjoy yourselves! Sounds great!! I am addicted to smoothies!! I just love your menu plans and reviews on recipes. I always end up saving a few to make later.